ABC7 News reporter Sergio Quintana traveled on a military helicopter and almost reached the crash site, until they had to turn back. KATHMANDU, Nepal (KGO) -- Recovery efforts in Nepal will resume at the spot where a U.S. Marine helicopter crashed on Tuesday. The Marines were on their way to provide aid to earthquake victims. ABC7 News reporter Sergio Quintana is the only Bay Area reporter in Nepal. He was on a helicopter heading to the recovery site Friday, until they had to turn back because of the weather. 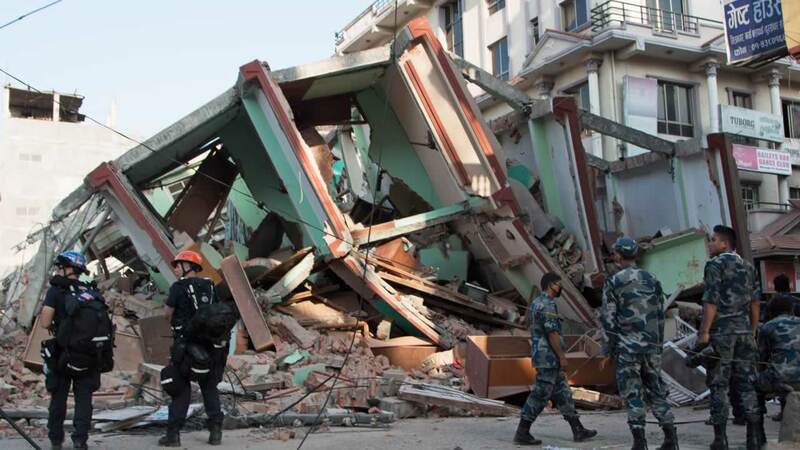 A magnitude-7.3 earthquake hit a remote mountain region of Nepal on Tuesday, killing at least 42 people, triggering landslides and toppling buildings less than three weeks after the Himalayan nation was ravaged by its worst quake in decades. "We almost got to see where this wreckage is... but just based on how steep everything is out there, it's going to be really difficult trying to recover, pick through some of that wreckage and even get clues as to what caused the crash," Quintana said. Officials say there were no survivors from the Marine helicopter that disappeared in rural Nepal on Tuesday. So far three bodies have been found. "Based upon what the general was describing, this was a pretty hard crash and the ability to get to the bodies from that wreckage is going to be the tough part," Quintana said. Global charities are offering emergency aid to Nepal following a massive earthquake that left thousands dead. Six U.S. Marines and two soldiers from Nepal were on board. "It's standard protocol if there's any kind of a military aircraft in the air there's supposed to be a Nepal army contingent. And there's so many of these countries that are coming here to help, that's one of the ways the Nepal army has really been able to really expand their ability to help their citizens," Quintana explained. Quintana was able to shot video out of the military helicopter as they tried to reach the crash site. There is a lot of damage to the rural communities nearby and with the steep the terrain, it is making it difficult to get to the crash site. "I don't think they've had a chance to even get those bodies out, much less even start combing through the wreckage and figure out what caused this crash," Quintana said. "I think from the onset, they had some impression it was a mechanical problem of some sort." The Marines plan to continue with their aid to Nepal as long as the country wants them to be there. California rescue teams are still there as well. This week they helped pull a woman from the rubble of a four-story building that collapsed on Tuesday. Quintana traveled with a U.S. rescue team who was delivering aid, when the 7.3 earthquake struck and has been reporting from the earthquake zone since. You can see all of his reports here.